The Paper.li service offers a lot of great components that help you supercharge your marketing. Today, I’d like to share a little about how you can leverage those some of the bells and whistles and elevate your paper by taking it Inbound! 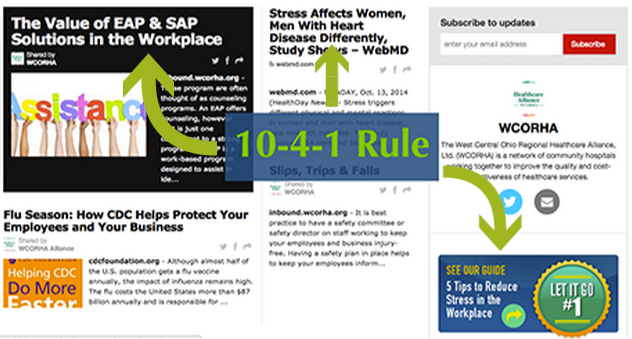 The 10-4-1 rule says that for every 10 industry articles you curate, also include 4 links to your company blogs, content pages or other information directing readers back to your site, and 1 direct Call-to-Action (CTA). Following the 10-4-1 Rule allows you to engage with your audience by providing them with the information and news they are looking for and still guiding them back to YOUR website for additional details and relevant information, thus driving your traffic, and building your pipeline. This strategy isn’t only reserved for websites and blogs. It’s applicable to content hubs, like your Paper.li. By incorporating a CTA in your daily paper you increase visibility and engagement opportunities between you and your readership, and your prospects, with actionable, trackable results. As you add industry information, resources, how-to’s and quick tips for your audience to your paper, you can also offer your readers a chance to subscribe to information from your website or blog. How? By directing them to your landing pages where they can complete a form to sign up for your blog or download the latest tips of the trade from your website. You can do this by curating a landing page into the headlines area of your paper by using the Paper.li Bookmarklet. Once installed on your toolbar, this handy-dandy little button allows you to automatically add information from any website into your paper, without have to subscribe to their RSS feed. This is the PERFECT tool for adding your landing pages into the publication to build your contact lists. Besides adding landing pages, it’s a great way to add any other articles you may come across throughout your day. You don’t want to overload your paper with your landing pages, so keeping 10-4-1 Rule in mind and that should help. Just 1! One of the many reasons Paper.li users upgrade to Pro is for more control over their paper’s look and feel. But the top reason marketers are upgrading to Pro is to have more control over our discreet, but effective Call-to-Action (CTA) overlay, shown any time you promote an article from your paper. Once you’ve activated the Call to Action overlay from within your settings, it will be applied when you share manually any individual article on your paper, using the share buttons under the article. It will also apply to any articles automatically promoted from within your paper settings. It’s an effective way to direct visitors of your article to anywhere you wish– your main site, a subscription sign up page, and more. To activate the Call to Action, go to your Paper Settings Dashboard > Social Media Agent > click on “Call-to-Action on Shared articles” to enable the feature and customize the messaging and enter the target URL. The default URL is your Paper.li paper but if you have an outside site, feel free to direct traffic to another site. Now you’re set to promote. Once published, your Paper.li newsletter is on it’s way to your subscribed readers as well as followers on Twitter, Facebook or LinkedIn. Many marketers use our easy-to-use Curated Email Service to keep their communities in the know, and others opt to use a third-party email marketing service or our integrated Mailchimp solution. Learn more about using Mailchimp or any third party service here. Depending up on the email service you use, you can track links, click-thru’s and opens as well, giving your Paper.li more value as a sales tracking tool. In addition, you can also download your opt-in Paper.li subscribers so you can add them to an existing list. Applying Inbound principles to your Paper.li is a solid way to ensure that you keep you and your company top-of-mind amongst your peers, clients and prospects. Give these tips a try and leave a comment below letting me know how they work for you.